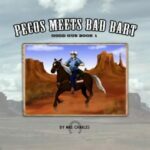 While Sheriff Gus is making his rounds, a stranger dressed in all black rides into Pecos. He isn’t very nice and scares the townspeople. 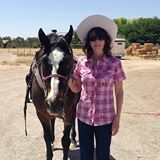 Will Sheriff Gus arrive in time to save the townspeople. The Cattle are Restless second in this series. In this one, Gus is surprised by a visit from his cousin Cory. While Cory is helping a rancher with his cattle, some of the steers start to run away. Can Cory and Gus save the town and its people? When the first Rodeo in the United States comes to Pecos, Texas, the twins, Johnny and Jimmy Ray are all excited. Their Ma insists that they stay away from the Rodeo until it is set up. 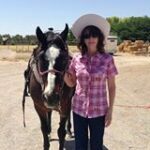 Of course, the boys don’t listen which leads to a whole lot of trouble with a bucking bull. 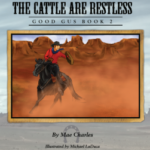 Good Gus is a series of children’s books based in the wild west. 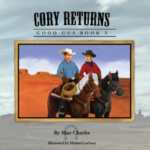 Good Gus is the sheriff of a town and each story is about different events that take place while Good Gus protects his town. 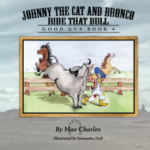 The stories are fun and exciting while teaching the readers good morals. Cory Returns is third in this series. Gus is happily awaiting a visit from his cousin Cory. When several days pass Cory’s arrival date, Gus begins to worry. Has something happened to Cory? Will Gus find him in time? Sign up to stay updated with what’s going on. 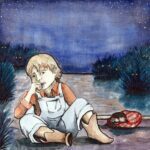 You can still sign up below to receive occasional emails about programs, events, and opportunities for children’s literature lovers and champions! We will not share your e-mail with anyone. Sign up below to receive tips, offers, and invitations.